Forget the bun…and the cheese…and the ketchup! In last week’s blog post, the emphasis on bold flavors in healthier summer fare was encouraged. 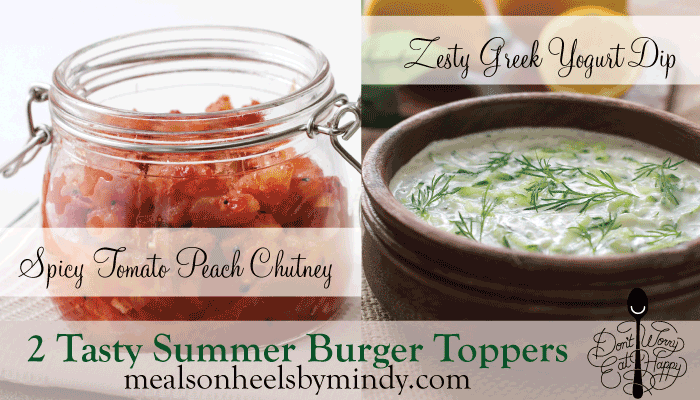 With that said, I know how hard it can be to give up the fresh bread and the delicious gooey cheese, but I can also wholeheartedly say that these 2 tasty burgers toppers will totally rock your summer barbecues. So hop on the healthier lifestyle bandwagon and get busy grilling up some Spring and Summer veggies as you and your family prepare for some serious lip-smacking eats. First, try the Zesty Greek Sauce topper on my Naked Salmon Burgers. Then, don’t be afraid to add both recipes to your condiment platter for grilled meats and fish. Spoon over Salmon Sliders and garnish with fresh sprigs of dill. In a bowl, crush garlic and combine with plain Greek yogurt, lemon juice, lemon zest, cucumber matchsticks and ground white pepper. Mix until incorporated. Lettuce, tomatoes and pickles may also be your go-to choice for burgers, but don’t fear other veggies and fruits. Have a look in your fridge and if you have any of the below, get ready for a new culinary experience!